Sonos Playbase is a slim soundbase for under your TV | What Hi-Fi? Sonos has added a soundbase to its family of wireless speakers, with the Playbase being pitched as an alternative to the Playbar for people who haven't wall-mounted their TV. Sonos says the Playbase is aimed at the "nearly 70 per cent of TVs" that aren't mounted on the wall, and therefore would arguably better suit a soundbase than a soundbar. Aside from the design, the new Playbase is almost identical to the Playbar, from sound quality to features to price (£700). So it's a digital optical audio output connection to your TV, rather than HDMI, with support for Dolby Digital 5.1 but not DTS or HD audio formats, such as Dolby TrueHD (or hi-res audio, for that matter). The Playbase connects to any other Sonos speaker and can also be used with the Sonos Sub and Sonos rear speakers in a '5.1' setup, as is the case with the Playbar. Ultimately, Sonos thinks the choice between the Playbase and the Playbar should be a cosmetic one. 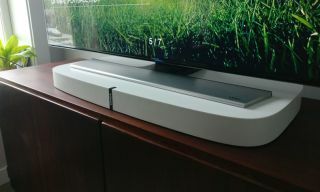 And the slimness of this new model, coupled with the ability to place your TV on top, will hold plenty of appeal. The Sonos soundbase stands just 58mm tall - the thinnest Sonos speaker yet - and measures 72cm wide and 38cm deep. It weighs 8.6kg, which makes it heavier than the Playbar, thanks in part to the new glass-filled polycarbonate material used in the "seamless, monolithic design". On the front, you'll find the same touch controls as found on the newest Play:5, allowing you to play/pause the sound, adjust the volume and select next/previous track when playing music. You'll also find some 43,000 holes in the speaker grille. Each hole is one of five different sizes and individually-drilled for the optimum dispersion of air and sound. In theory, at least. Behind the holes are ten speaker drivers - three tweeters, six midrange drivers and a subwoofer. Each driver has been designed for the Playbase, and each has its own Class-D amplifier. The Playbase is compatible with Sonos' Trueplay room equalisation technology, which tailors the sound to your room. It will get Amazon Alexa voice control when an update rolls out across Sonos speakers. The Sonos Playbase is available in either black or white finishes, and goes on sale in April, priced £700 ($700/€800). MORE: Which is the best Sonos speaker for you?